Super Savings Item! 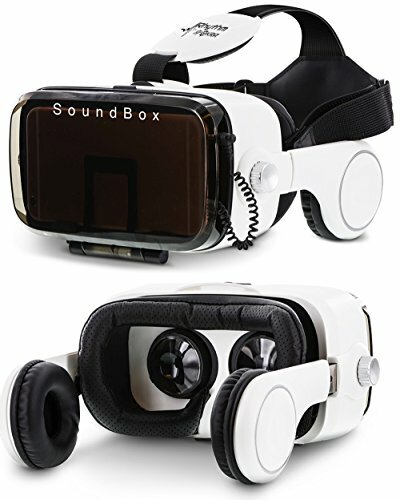 Save 32% on the Okra Rhythm SoundBox VR Virtual Reality Glasses Headset - 3D 360 Panoramic with Built-in Stereo Headphones (Hi-Fi Sound) for iPhone or Android by Okra at DJ Luu. MPN: OK-SBG-08. Hurry! Limited time offer. Offer valid only while supplies last. CUSTOMIZED VISUAL EXPERIENCE - Gaming and watching movies in VR works best when your eyes properly align with the screen box. That's why our VR headset offers adjustable pupil distance and Object Distance to expand the viewing angle and perfectly match focal distance and alignment for reduced distortion. COMFORTABLE WEAR DESIGN - comfort-fit experience with face foam protector, soft nose bridge piece and a fully adjustable ergonomic T-shaped head strap Belt, ensures a balanced stress condition in three points on the head reducing pressure to the eyes. If you have any questions about this product by Okra, contact us by completing and submitting the form below. If you are looking for a specif part number, please include it with your message.